The San Jacinto River Authority (SJRA) is responsible for developing, conserving and protecting the water resources of the San Jacinto River Basin. SJRA's boundaries include all of Montgomery County and parts of Walker, Waller, San Jacinto, Grimes and Liberty counties. SJRA's Highlands Division – the oldest of the four operating divisions – is responsible for the consistent, reliable delivery of raw water to companies like Exxon Mobil, Chevron Phillips Chemical Co. and other contracting municipal, industrial and agricultural customers. 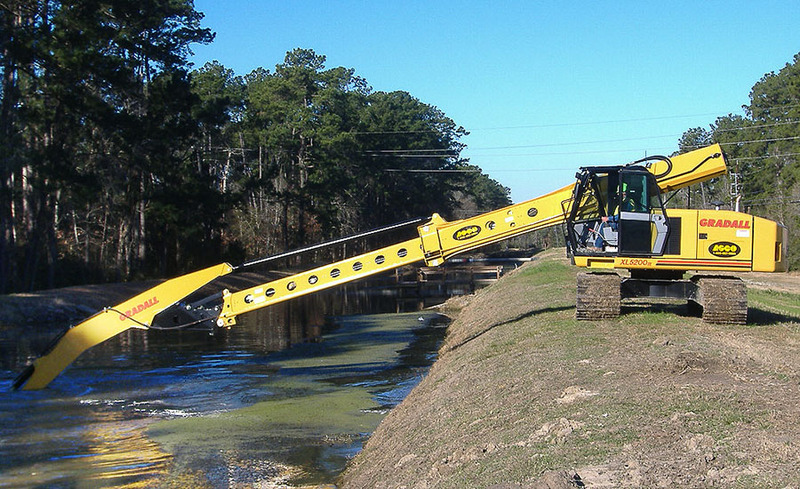 To accomplish that, the division must maintain an extensive reservoir system, requiring the versatile capabilities of a Gradall XL 5200 III excavator equipped with a long-reach Telestick boom extension. "We use the Gradall to keep about 38 miles of waterways open and supplying raw water to our customers," said Kenneth Forrest, Operations and Maintenance Manager for the Highlands Division. "We use every bit of the 50 feet of reach we get from the Telestick," he said. "We can reach out and down to dig out silt and water grass from the bottom of the canals. 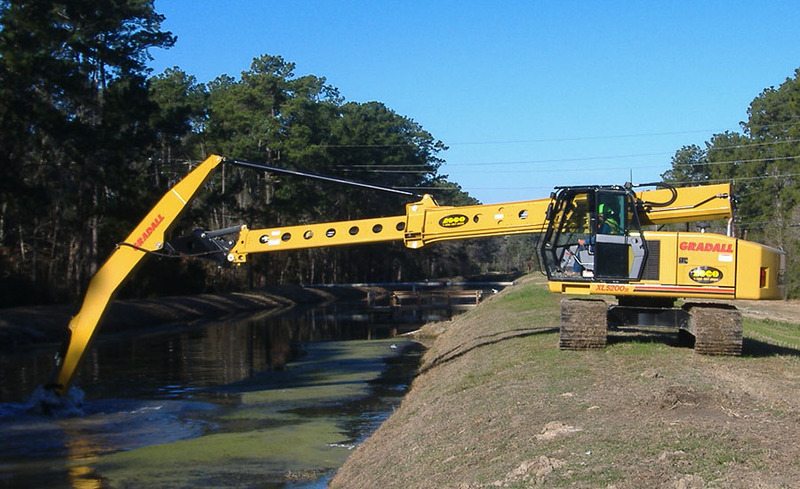 The canals are between 40 and 80 feet wide, so we work both sides with the Gradall and the Telestick to get the job done." A new Telestick design is much more robust with harder material at the pivot points, creating less boom swing when removing buckets full of material. The design is fast and easy to install, hooking onto the bucket adapter. "That comes in handy when we switch between the Telestick and a 12-foot boom extension," said Forrest. "We use the shorter extension and a cleanout bucket to do some re-sloping work along the canals when we're not dredging." In both applications, Gradall's famous boom movements further enhance the productivity and versatility of the machine. 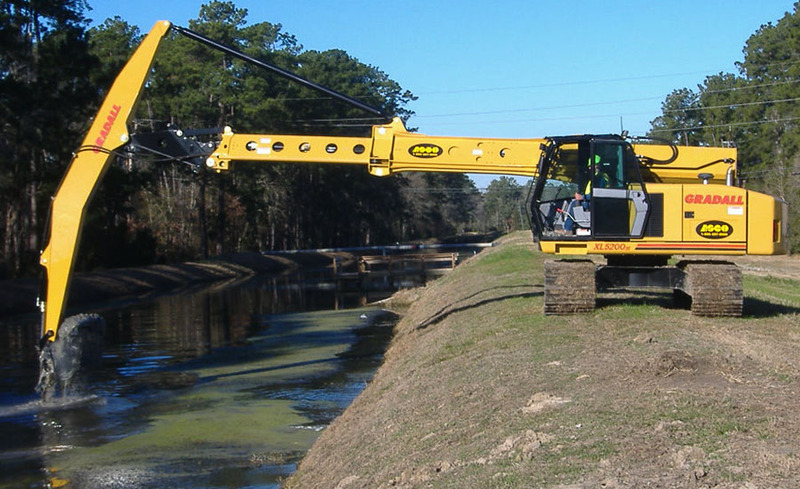 Minimum overhead working requirements are still lower than conventional knuckle booms, plus there's no loss in boom power as the bucket tilts 220 degrees to work on the slopes and side of canals. The XL 5200 III excavator is the largest construction model in the Gradall crawler collection, weighing just over 54,000 pounds. Designed to handle a range of high-productivity jobs, the machine uses load-sensing hydraulics to work efficiently without wasting fuel. The long crawler track provides a solid work platform on slopes or rough terrain.